The family at Jim Jim Falls. 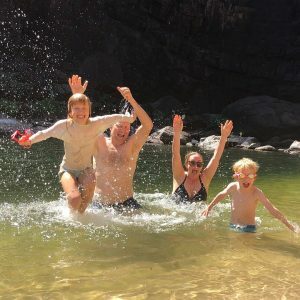 My family and I recently returned from Life’s An Adventures’ five-day Kakadu and Beyond walking tour. 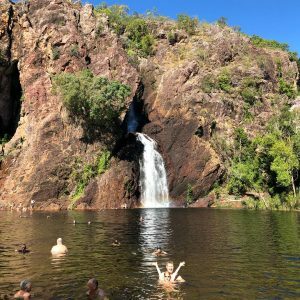 It was the winter school holidays which made it the ideal time to get out of chilly Sydney and head to the Top End to thaw out. 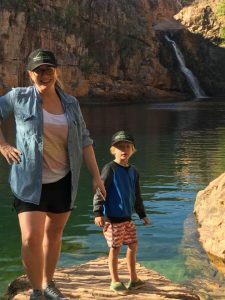 This pack-free guided walk explores the spectacular stone escarpment and dramatic scenery of NT’s most famous wilderness area. It’s an ancient land covering almost 20,000 sq km and home to over 2,000 plant species, amazing wildlife, hundreds of bird species and Aboriginal rock art paintings dating to prehistoric times. “Will we get to swim?” asked eight-year-old Matilda on the flight to Darwin. 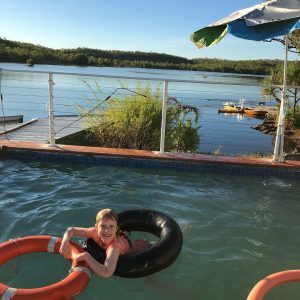 And so, without further adieu here is Matilda’s 15 swimming spots on our Top End Holiday. The first was at our hotel in Darwin. The pool was small but the water was perfect and Matilda and her six-year-old brother Billy loved nothing more than jumping off Dad’s shoulders (i.e me). The following day our tour began and after being collected by our guides in Darwin we drove to Litchfield National Park. Our first stop was the fascinating magnetic termite mounds that face north-south – and then it was off to some wonderful waterholes. Swims two and three were at Florence Falls and Buley Rockhole. Swim four was at the pool at our first night’s accommodation at Lake Bennett. The next day we headed to Kakadu NP and our first stop was the ancient rock art sight of Ubirr before going on an exciting boat ride on the East Alligator Rover River. We didn’t see any alligators (of course) but we spotted dozens of saltwater crocs. No swimming in this river kids! Our night’s accommodation was at a new resort called Anbinik, which included a pool (swim number five). Anbinik specialises in Thai food and it was some of the best Thai I had ever eaten. Five stars. Day three of our tour began with a walk around Kakadu’s Stone Country where we saw more amazing rock art and some of us did the 12km Barrk Sandstone Walk. That was a bit too long for the kids but the good thing about Life’s An Adventure’s walks is they often have a medium and easy walking option for those who want to take it easy. That afternoon we all took an amazing scenic flight over Kakadu – because Life’s An Adventure loves the ‘wow!’ factor and we were duly ‘wowed’! Day four included an hour long rock hop to Jim Jim Falls where we had two swims – one under the waterfall and one next to sandy bank that was more like a beach than a swimming hole. On day five when we visited Maguk, previously known as Barramundi Gorge, which included a gorgeous waterfall (swim nine). Swims 10 and 11 were at Gunlom. The first was just near the carpark and the second was up a steep rocky trail where a gorgeous infinity pool was waiting. Billy and his mum Holly at Maguk. At the end of the day we sadly said goodbye to our guides and new friends that we meet on the trip and drove back to Darwin. The next day swims 12 and 13 were on Darwin’s Waterfront. They consisted of a wavepool and a lagoon. Swim 14 was at the Darwin Ski Club, just near the city’s wonderful museum and finally swim 15 was at Lake Alexander, near Fanny Bay. Matilda swimming at Lake Bennett Resort.